Coconut cake is an irresistible dessert. Cut yourself an extra large slice and enjoy a night off. In a bowl, with a mixer on medium-high speed (use the paddle attachment if using a standing mixer), beat butter and 1 1/2 cups sugar until fluffy and pale yellow, 4 to 5 minutes. Add eggs, then yolks, one at a time, beating well after each addition and scraping down sides of bowl as necessary. Beat in vanilla. In another bowl, mix flour, baking powder, and salt. Stir (or beat at low speed) about a third of the flour mixture into butter mixture. Stir in half the milk just until blended. Stir in another third of the flour mixture, then remaining milk, followed by remaining flour. Fold in 1 1/2 cups coconut. Scrape batter equally into two buttered and floured 9-inch round cake pans and spread level. Bake in a 350° regular or convection oven until a wooden skewer inserted in the center comes out clean, 25 to 30 minutes. Cool on racks in pans for 10 minutes, then invert cakes onto racks and remove pans. Cool completely before frosting. For frosting, in a large bowl, with a mixer on high speed, beat whipping cream with 2 tablespoons sugar until soft peaks form; fold in rum. Split the layers of the coconut butter cake, making four; spread each of the first three with about 3/4 cup of the whipped cream. 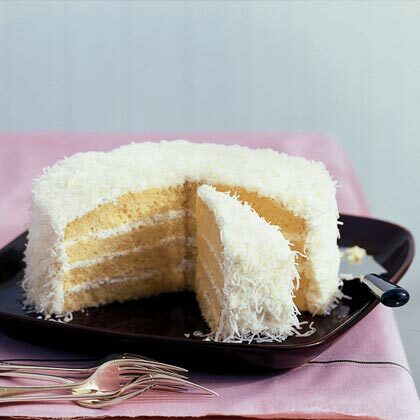 Frost cake with remaining whipped cream, then sprinkle top and sides generously with additional dried coconut. Chill at least 1 hour. У нашей организации полезный портал со статьями про визуализация интерьера.